Our congregation is made up of people of all ages and from a variety of backgrounds, some who have been Christians for most of their lives, some who have just started on their journey, and others who are finding out whether they want to begin the journey! We meet in Hadfield, (Near Glossop), every Sunday at 10.30. We use a mix of modern worship songs and some older hymns (albeit often in a different style than they were originally sung! ), and the meeting tends to be informal with opportunity for people to express themselves, pray, and listen to what we believe God is saying, all with a view to then living out our lives in the abundant and exciting way promised in the Bible (John 10:10). From time to time we have a ‘café style’ church service where we invite friends, neighbours and families to share breakfast with us, worship in different ways, and explore some key messages in the Bible. The church has now been established in its current form for over 20 years and we look forward to the future as we seek to learn more about God and His word, help and encourage each other, and look to take something of God’s heart, love and Spirit into the communities in which we live, work and socialise. We know that God makes a difference for the better in peoples’ lives irrespective of their current situation, and we like to share our experiences of Him (Psalm 145:4). We are blessed with a newly refurbished building on Station Rd, Hadfield where we meet on Sunday mornings and also for Bible study on a Tuesday evening. 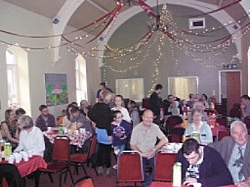 We also host other community type events through the week.But of course the church is not the building, it is the people, and if you come along to see what we are all about, you are guaranteed a warm and friendly welcome, lively praise and worship, friendship and support, and encouragement (and maybe a challenge or two) from the Bible. Singing and music play a big part in our get togethers. 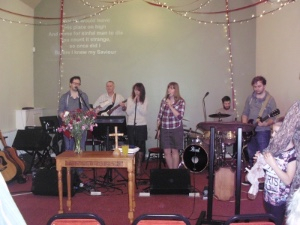 We have a fantastic band of musicians and singers who lead us in worship during our Sunday services. This can vary from loud and fast to quiet and reflective, with a wide range of both modern and traditional songs and hymns. 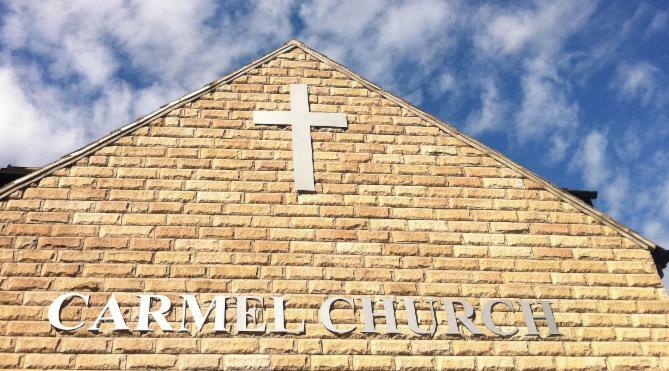 Carmel is a member of Assemblies of God. It is a classical Pentecostal fellowship of evangelical churches. We believe that our church is like a family and we welcome families into our church. We offer Sunday school classes for different age groups within our Sunday morning service. We have a dedicated team of volunteer Sunday school teachers who have all been approved by the church leadership, with those working with the younger children, holding DBS certificates. We follow a fun programme of age appropriate teaching and activities. Classes are split by age - under 5s, 5-8 years, 9-14 years (the older group will be split very soon into primary / secondary school age groups). We are also in the process of setting up a group for the young youth (age 11+) to meet for games, fun and fellowship. We also work with St Andrew's Church, Hadfield to provide an annual kids summer holiday club and other children's events. 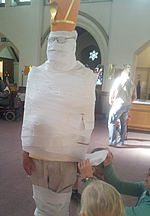 last year we had an "Egyptian Adventure" looking at the Bible stories of Moses and Joseph.